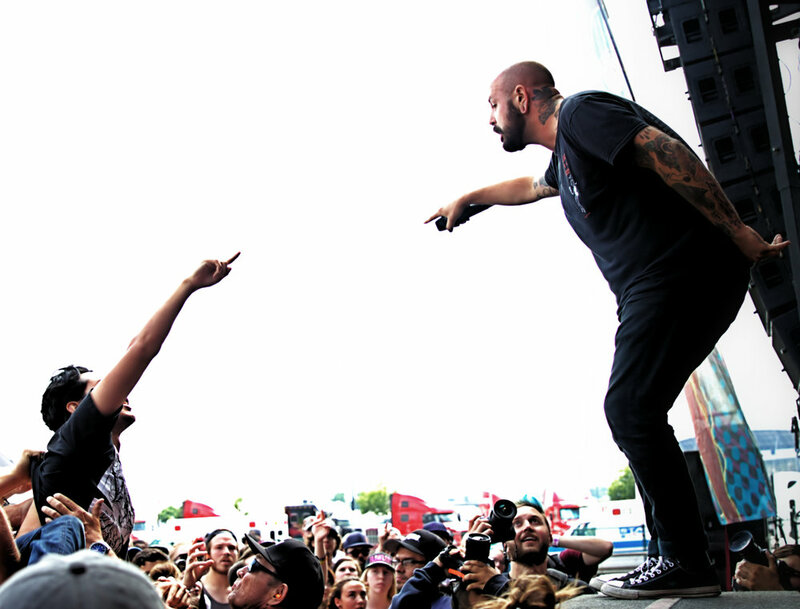 In it's last year as a touring festival, there is much to do at your last Van's Warped Tour. Having the official WT app will keep you up to date on any news or announcements before and at the festival. The app also answers some of the most common questions that people have, from what you can bring to where you can meet your favorite bands. And most importantly, it lets you know which artists are playing at your Warped Tour date. Download it ASAP, and get yourself a portable power pack while you’re at it! You don’t want a dead phone right before that selfie with Mayday Parade. Warped Tour happens during the hottest time of the summer, so it's important to take care of yourself. This means staying hydrated! There are water stations on the fest grounds, so all you need to bring is a clear empty water bottle and you're golden. Make sure to check the weather before you head out too so you can have the sunscreen on hand. A bro tank sunburn never did anybody no good. Warped Tour is basically a giant party full of people that like the same kinds of music as you do. It’s a place where you are free to express yourself and go a little bit wild without the fear of being judged. So branch out of your comfort zone and talk to someone new while you’re enjoying the festival! Your phone will still be there when the conversation is over. There are a wide variety of nonprofits traveling with the tour who do amazing work for their communities. From The American Red Cross to To Write Love On Her Arms, there is sure to be a non-profit that interests you. And who knows! Maybe you’ll end up volunteering with them after your Warped experience. Bonus: If you bring either three canned goods, a used cell phone, or a $5 cash donation for Feed Our Children NOW, you can get express entry to the fest. Check out the full list of non-profits here. The Entertainment Institute (TEI) provides 40-minute backstage workshops with your favorite Warped Tour artists. Workshops can range from drum lessons to insights about the music industry. It’s a great way to see a different side of your favorite musicians and ask them all those burning questions you’ve had. Class sizes are limited, so get a ticket early! You can see which workshops are available here. This is the last year of Warped Tour as we know it, which means its your last chance to snag some Warped Tour memorabilia. The first opportunities to grab yours are with the 2018 compilation CD and the collectible 3D souvenir tickets; on the day of your fest there will also be one or two merch tents with official Warped merchandise to peruse. Different organizations and record companies will be giving away free items as well, so keep an eye out! Who doesn’t love meet & greets?! Every band will have their own merch tents set up throughout the festival day with a scheduled stop by time. This is a great way to meet some of your favorite band members and get something autographed or grab an infamous selfie. Warped Tour is known for having a number of big name bands, but they also support many lesser known bands as well. Some bills even include local acts playing just your city’s fest. So while your waiting for your favorites on the main stage, make sure to check out the smaller stages like owly.fm Stage and Full Sail Stage. You might just find your new favorite band! The final year of Warped is full of some of alt rock’s favorite bands, from icons like electronic duo 3OH!3 to Motionless In White for the metalheads so try and see as many of your favorites as possible! After all- THIS. IS. IT. Make sure you get to the fest early to find out set times on the classic inflatable board or snag a $2 paper schedule. This is the last time we’ll be able to experience Warped Tour as we’ve known it for the past 25 years. Whether it is revamped somehow or changed to something completely different is yet to be seen, so it’s time to enjoy what’s left while we have the chance. Take it all in and experience all that Warped has to offer you. And as always, practice safe moshing and crowd surfing and take care of one another. Though it’s the end of an era, it could be the start of your relationship with a new friend or a new favorite band. Here’s to you Warped Tour!